This is probably the most important part of Urbano - your own personal Dashboard. 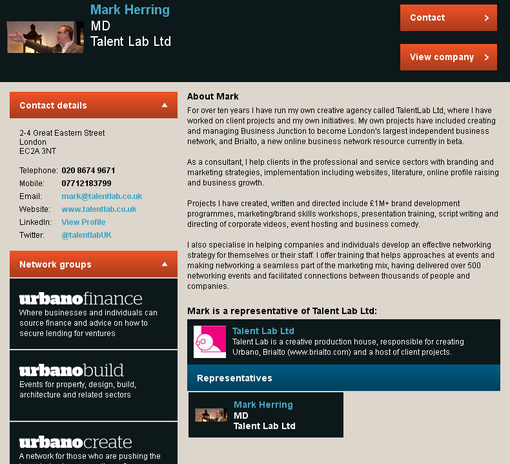 Here you can edit your own and your company's profile, book events, add your own company's events, send invitations to other companies and their representatives, send contact requests to individual representatives, network groups or the whole of Urbano's membership - and opportunities to supply your company or company's known to you! As the site develops, log in every day to see who is joining, what's happening and make your own contributions to the Urbano community. This is my profile page and like yours it will be viewed daily, so ensure it is complete and up-to-date! The 140-character description on your profile card will be used for networking events, but the longer profile is where your personal and company news and information can be strengthened by you and referenced by others. Your Twitter and Linked In updates will also be seen on this page, as well as the Networking Groups you personally belong to. Remember, a company cannot network, but you can. Note the CONTACT button. As members, you can send messages to members through their profile cards. Control the access have to you through 'Settings' on your Dashboard. Every Representative of a member company can upload their own events to the Urbano Calendar AND send out invitations to those events. These events can be seminars, presentations, bar openings... in fact, any event in which you are taking part in or even other networking events you have created or are managing. 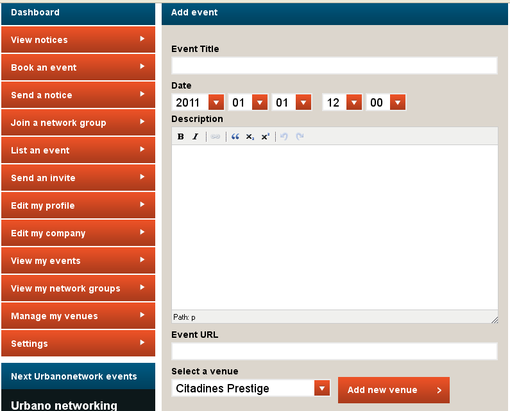 Note that the venue where the event is taking place has to be added but once it has, you can use the drop down list to select it for future events. 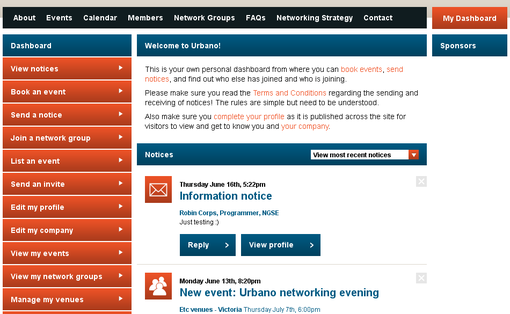 An important part of Urbano is its Network Groups. Urbano's networkjing seminars will be attached to them, but you can attach yourself to those groups whihc are relevant to your company or you as an individual. For example, if you are personally involved or interested in HR, you should join 'Urbanopeople' even though your company is in engineering. You are free to join any Network Group you wish to! 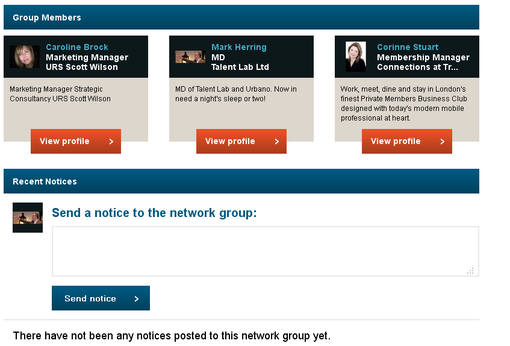 Members of each Network Group can send messages to the group which are automatically archived on the Network Group page. So please update your profile, join at least one Network Group and list any event as soon as you know its details. It's your Urbano - use it!